High Security Paper Blue, Blank Sheets SSPH01 At Print EZ. 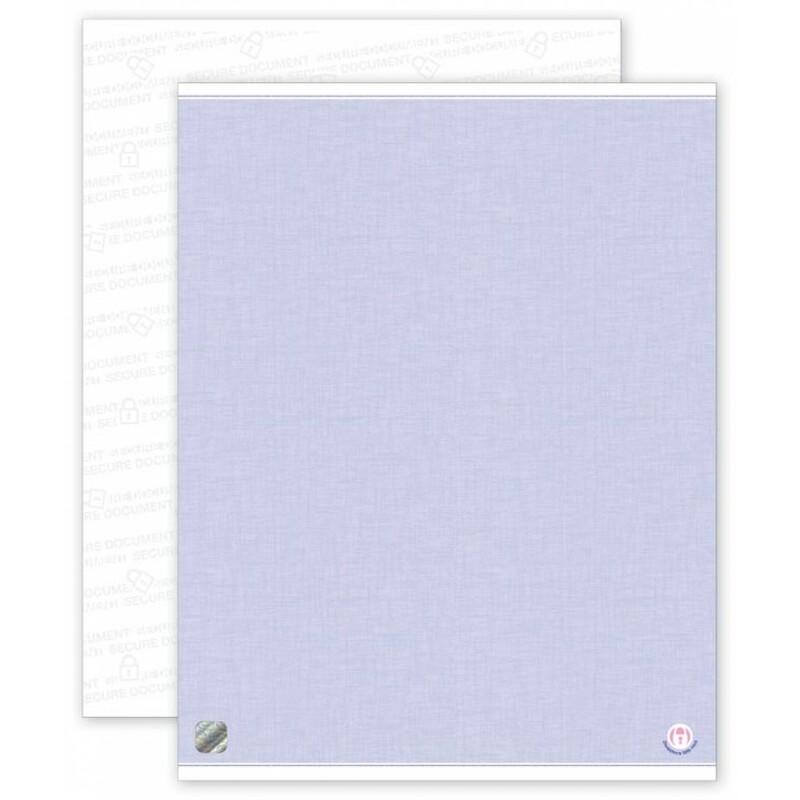 High Security Paper Blue, Blank Sheets Item No. SSPH01 Size: 8 1/2" x 11"
Visible state-of-the-art hologram and embedded fibers send an immediate message: This document is private and confidential! Protect confidential and sensitive information by printing originals on high security stock with built-in anti-reproduction and tamper-detection features. High-security paper stock safeguards confidential business, legal, healthcare and personal information by preventing unauthorized copying of documents. Foil hologram: Optically multidimensional (3D) foil seal fused to the paper stock cannot be photocopied. Visible fibers: Blue fibers randomly embedded in both sides of the paper make duplication difficult. Void pantograph: The word "VOID" appears prominently across the document if photocopied or scanned. Thermochromic (heat sensitive) ink: The lock icon will fade and return when rubbed between thumb and forefinger, or breathed upon, if document is original. Microprint feature: If photocopied, 1-point type in border appears as a dotted line. Chemical sensitive paper: Stains or spots appear if chemical alterations are attempted; instantly indicating tampering. True watermark: Visible only when held up to a light and cannot be photocopied. Beware if it isn't there! Fluorescent fibers Certain fibers in paper are only visible when exposed under fluorescent light. Warning box: Security features listed on back of paper deter fraud, unauthorized photocopying and tampering.